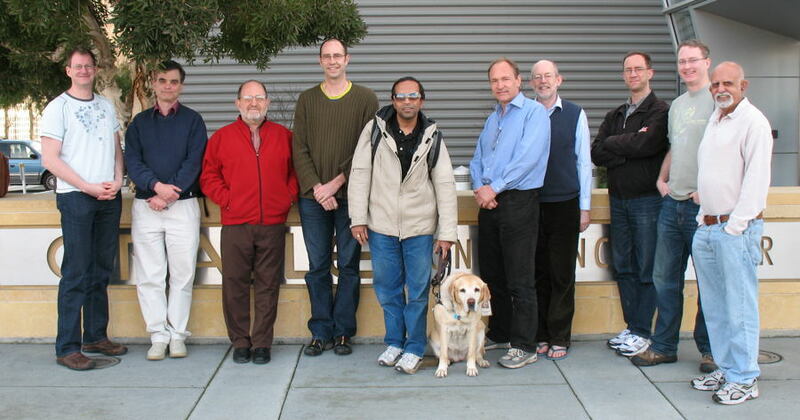 W3C | TAG | Previous teleconference: 19 Feb 2009. | Next teleconference: 12th March 2009 (tentative). 15:45-17:00 This was supposed to be errorHandling-20: Error handling, but we decided to use it for more of xmlFunctions-34. There are some other topics we may decide to discuss in the free time slots. Suggested discussion goals and preparation materials are available in the section linked below. Note that preparation is also encouraged for some items for which fixed time slots have not been allocated. We may or may not decide to discuss some or all of these, presumably in the sessions not yet scheduled. The campus is located about 10 miles South of San Francisco (SFO) airport. See map for directions. When, if ever, is it appropriate to use content negotiation to choose between representations of a resource and descriptions of that resource? Should redirection be used in conjunction with content negotiation for such purposes? The treatment of content negotiation in HTTPbis is likely to be revised, and there is some suggestion that content negotiation should be deprecated. Larry Masinter email indicating that he will be updating the HTTPbis section on content negotiation. Tim Berners-Lee response email suggesting that deprecation of content negotiation would be a bad idea (member only). Decide what, if anything, the TAG should set as goals for work on HTML this year. Explore ways that we can be helpful to the HTML 5 working group and to other W3C groups that provide HTML-based technologies. Clarify relationship to TAG work in areas such as error handling, versioning, etc. T.V. Raman's analysis prepared for agenda of the TAG's Sept. 2008 meeting in Kansas City. It's in the agenda itself under the heading tagSoupIntegration-54 - HTML and The Web. Explore architectural principles relating to error recovery by software receiving incorrect data from Web interactions. Explore tradeoffs involving silent recovery from errors, robustness of Web communications, risk of incorrect processing, proliferation of incorrect content, vs. convenience for others and recipients of documents. Clarify relationship to TAG work in areas such as HTML/Tag soup, versioning, etc. Bring new (and returning) members up to date on prior work on XML Functions. Brief discussion of technical issues, if time permits. Clarify goals and next steps. Bring new (and returning) members up to date on prior work on issue URNsAndRegistries-50. Email from Martin Nally describing challenges in deciding whether to use content negotiation to choose between the presentation and the data driving the presentation in an Ajax application. This email also relates to application state management and use of URIs to track application state. Clarify relationship to TAG work in areas such as metadata, content negotiation, site description metadata, etc. The TAG goes into this meeting with 28 open issues. The overall goal of this session to identify a few key issues from our previous work that we will designate as possible major focus items for the coming year, to identify other issues that should remain active with lesser emphasis, and as appropriate to close (or open) others. In other F2F sessions, we will consider suggestions for new focus areas and priorities, so the final TAG agenda for the coming year will likely be a combination of ongoing work continued or refocused, along with new undertakings. This particular F2F session is aimed at ensuring that we understand and are properly tracking the status of work already underway. When we are done, the issues list should reflect in the description field the goals, deliverables, checkpoints, and success criteria for issues that remain active. Ensure that goals, deliverables, checkpoints and success criteria are understood, at least for high priority issues and preferably for all active issues. Recommend whether the issue should remain open or be closed. If open, then whether the issue should be one of the few key focus areas of the TAG, or should have lesser emphasis. After the breakout reviews are done, we will discuss recommendations, especially for high priority focus areas. If time permits, we will agree on revised status for all issues. If that proves a bad use of F2F time, then we will plan to finish the job via email and/or telcons as appropriate. The essential goal here is to learn enough that we can appropriately balance proposals for new TAG work with following through on our existing activities. Also, the chair would like to propose more direct ongoing (I.e. post F2F) involvement of the rest of the TAG in tracking the status of particular TAG issues. We will discuss details at the F2F. Review open TAG issues table below. Think in advance about which ones we should be our main priorities, which ones should be closed, and which should continue as background activities. Determine specific TAG goals and priorities for coming year. For each such goal or direction, briefly identify success criteria, timeframes, the intended audience for any materials we produce, and next steps. Consider whether the Architecture of the World Wide Web and the findings that the TAG publishes are effective in getting the attention of and educating their intended audience(s). We will discuss this topic at least twice. The first session will focus on briefly reviewing proposals for new directions for TAG work, as well as proposals for which ongoing activites should be emphasized. We will also discuss which aspects of the TAG's work have been most effective, and which have not been effective. Note that we will in a separate session do a detailed review of all ongoing TAG activity (I.e. open issues), closing and reprioritizing as appropriate. The results of that analysis will be used as input to the second round discussion, which will attempt to set our overall priorities for the coming year. Read draft of Guide to TAG Participation (W3C member-only). Either be prepared to endorse it as is, or to suggest specific changes. No specific discussion time is allocated to the following, but we may choose to discuss these in some of the free time slots. (late addition to this agenda) The TAG has, within the last week, been asked to help resolve concerns with the use of CURIEs in RDFa and with the HTML profile attribute. See very long email thread that was instigated with an email message from Mark Nottingham to www-tag titled "Using XMLNS in link/@rel", which in turn promoted a message to the public-html list from Julian Reschke titled @rel syntax in RDFa (relevant to ISSUE-60 discussion), was: Using XMLNS in link/@rel. The long thread starts with that; early messages in the thread were not cross-posted to www-tag, but later ones were (starting with this one). ACTION-183 (David Orchard) Incorporate formalism into versioning compatibility strategies. Due 3 March 2009. ACTION-221 (Jonathan Rees) Work with Dave Orchard to close up the formalism facet of the versioning document, due in two weeks. Due 24 February 2009 (OVERDUE). ACTION-229 (Noah Mendelsohn) Noah to respond to John Kemp proposal of Feb 17 on versioning. Due 13 March 2009.
Review open action items: reassign owned by those who are leaving the TAG. Update on the Architecture of the World Wide Semantic Web AWWSW work. The following list was extracted from Tracker's list of open issues. The "F2F" column indicates issues that appear as explicit agenda items for this F2F. We will discuss the "Proposed Priority" column at the meeting.